You will be pleased to hear that the funding for the above event is now in place, and we are ready to roll. Please remember to save the date for this free community musical and fun event, which will take place on Seal Recreation Ground on Sat July 11th from midday. There will be live music throughout the afternoon and early evening, representing many genres. Messy Church will be available for all children wishing to have fun, get creative (and, of course, messy!). There will be a hog roast, BBQ, Indian delights, beer tent, or if you wish to make it an entirely free fun-time, bring your own picnics. There will also be teas and cakes for sale in the pavilion between 2pm and 4pm.Remember to bring your own seating, rugs, gazebos or sun shades if wanted. Please remember to email me if you can spare a bit of time to set up and clear away for this event. Your help will be very much appreciated. 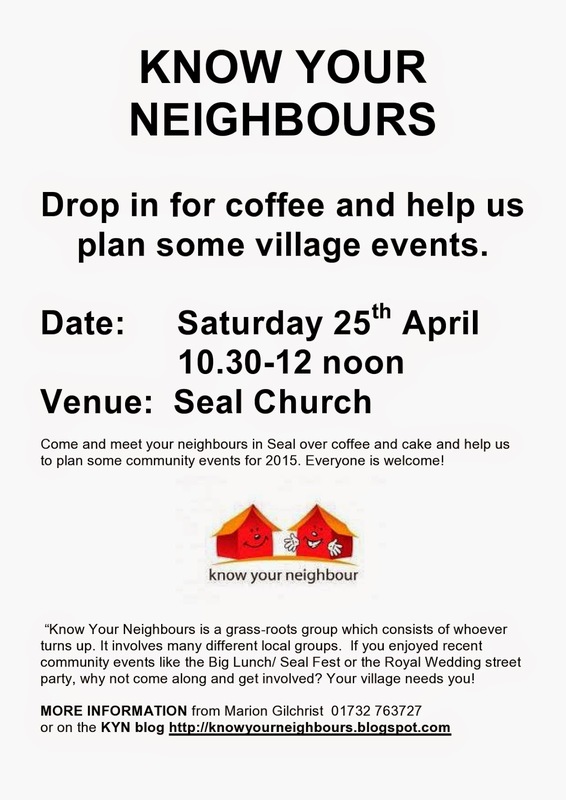 The Church is also looking for volunteers to help with the beer tent and tea rooms. In the meantime, Seal Church will be celebrating their Patronal Festival, by holding a Strawberry Tea in the Vicarage Garden at 4pm, where delicious sandwiches, cakes and cream teas will be served at the cost of £5 for adults and £2.50 for children. Everybody is welcome to this lovely summer event. Just email priest@sealpeterandpaul.com, or tel 01732 763585, or sign on the list at the back of Church, to let us know you will be coming. You will probably be aware by now that today sees the first day of PYO strawberries at Stonepitts! Here's to a long season! One last request! We are looking for a volunteer to assist the local library with a home delivery service to a couple of people who cannot make it up to the library themselves. 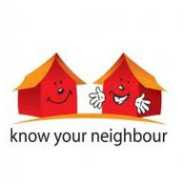 We have a lovely lady who has been delivering this service on behalf of Know Your Neighbours for some years, but now finds herself stretched a little thin. If you feel you are able to assist with this project, please don't be shy!! Send me an email and we can have a chat about what is involved. Looking forward to hearing from MANY of you! All your efforts are always greatly appreciated, and this community would not be able to thrive without them. Mon June 1st – The Theobald Family with Michael Oxtoby. Mon July 6th – The Lyles, Sugar, Kemsing and Seal with Colin Lyle. Mon Sept 7th – Architects who Built Seal with Peter Mountfield. Mon Oct 5th – A.G.M. Mon Nov 2nd – To be Arranged. 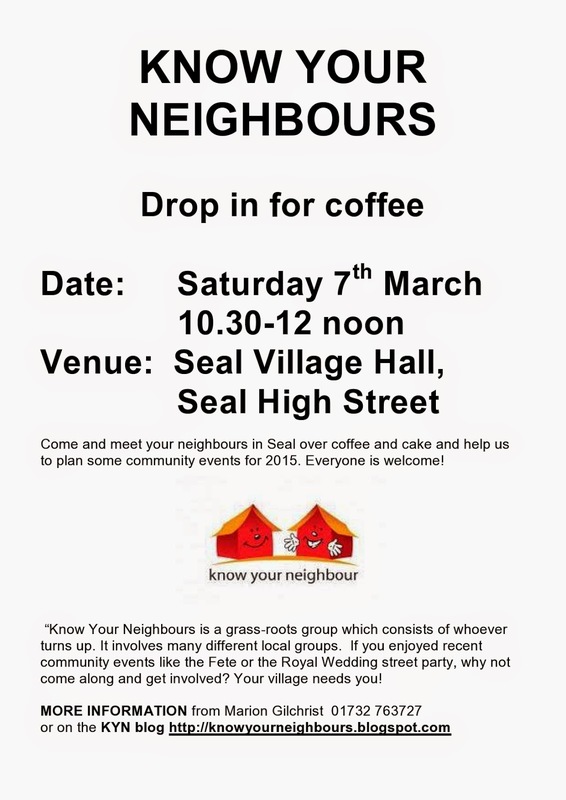 Notes From The Know Your Neighbours Meeting Seal Village Hall Saturday March 7th 2015. 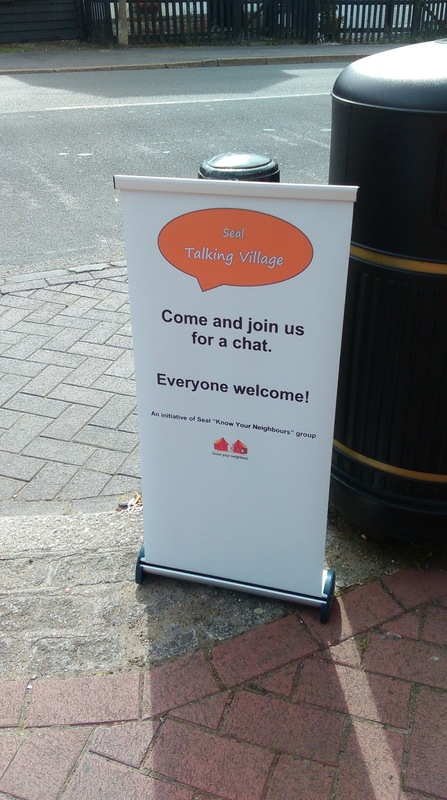 The purpose of this meeting was to bring as many people together to catch up on current activities within our existing village organisations, and to get ideas for events for 2015. 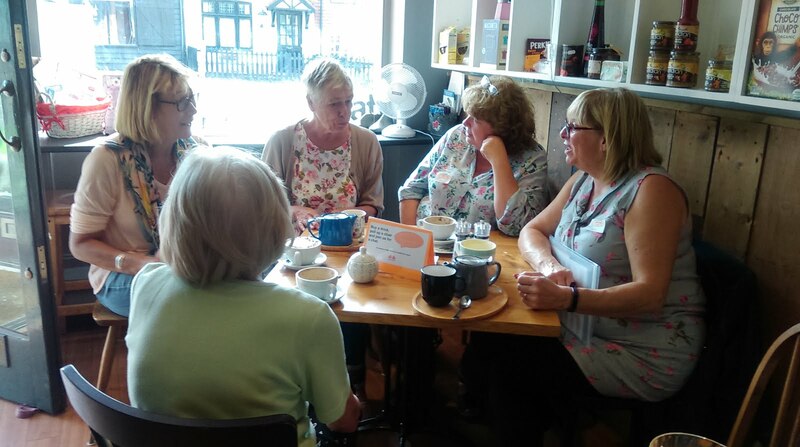 We had a few e mails from representatives of organisations who couldn’t make the meeting, so their issues were talked about along with those of the representatives present. Peter Mountfield was representing Seal Village History Group. Anna Lindley who has been leading the group, has now had to stand down due to other commitments. He explained that membership is fairly low, and much more help was needed to keep the group sustainable. Currently, the History Group meets in Seal Library at 7.15 for 7.30pm every first Monday of the month. This costs £25 per session, so if anybody has ideas as to another, more affordable venue, please pass them on to Peter Mountfield. (If you would like to contact anyone mentioned in this post, please let Anne or Marion know and we will pass on the message to the relevant person).Also, if you have ideas for promoting the group to reach more, potential members, please contact either Peter or myself. Help is needed to sort the archives – a really interesting project for anybody with a little time on their hands. Meanwhile, anybody wishing to join the group, please just come along to Seal Library any first Monday of the month. I am attaching the programme for the next few months. Anne Le Bas reported that the Belly Dancing classes are back! 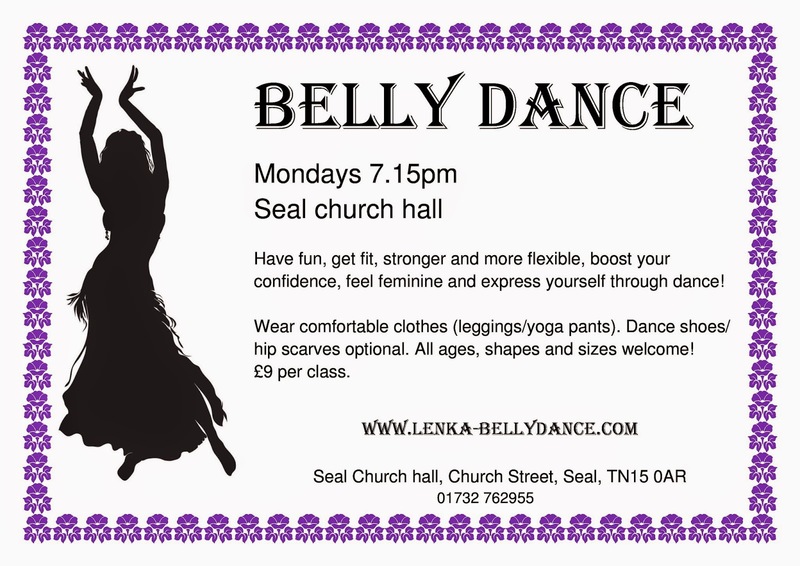 Seal Church Hall every Monday from 7.15 8.45pm. There is a new teacher, but the classes are still popular and cost £9 each session. Anne is happy for you to contact her for further details. Email addresses at bottom of page. Debbie expressed concern for the safety of anybody in the village, using the back roads behind the A25. She lives in a house on The Green, where you have to step out of your front door and onto the roadway. Quite rightly, she is saying that traffic uses this route, often to avoid sitting in queues of traffic in Church Street, and cars drive through the back of the village far too fast. She is putting a petition together and is hoping to get as many signatures as possible from people in the village. Debbie will make sure that as many local businesses have a copy of this for us all to sign and present to the Highways Committee at Kent County Council. Frances Fish had e mailed me to say that there are vacant plots on the allotments at the moment. The cost for these is £15 annually for half a plot and £25 for a full plot. There were several members of the Allotment Society present, and all were making very positive comments about the benefits of being involved. Luci Napleton also e mailed to remind us of the 50+ Dance For Fun Classes, which are held in Seal Village Hall, every Tuesday from 10.30 – 11.30am. The cost is £4 a session and you can contact Luci for more information on 07748008431, or e mail on the address at the bottom of the page. Nicky Harvey was representing the Beavers, Cubs and Scouts, as always! The news here is that there is a very desperate need for Scout leaders. Anybody interested, would need to have the statuary DBS check, and commit to about 2 ½ hours each week during term time. This is a thriving scout group, with a waiting list, but without more leaders, the group will have to disband or at the very best, merge with Kemsing. Nicky has run this group for 8 years, and now, due to many other commitments, she has to give this up. PLEASE, if you can commit, or know anybody else, that can, and would be a great scout leader, please contact Nicky. E. Mai address is at the bottom of the page. Jenni Pascoe was representing Seal Primary School. The school May Fair will certainly be taking place this year, along with many other events. We will be putting out the details through this newsletter and advertisements in The Local Advertiser. There is a free First Aid and Defibrillator Training, being organised by Sevenoaks District Council on Saturday 18th April. There will be two sessions – one in the morning and one in the afternoon. This will be particularly useful, as we will be having our very own defibrillator in Seal, outside the Village Hall, very soon. If you would like to take up this offer, the joining details are at the bottom of the page. Following last year’s success, Seal Church will be having another Scarecrow Festival this year, leading up to harvest time. Due to the comments about an accident, last year, we may take some safety precautions to warn people to keep their eyes on the road. There will be many other events throughout the year, and we will put details out of these throughout the year. 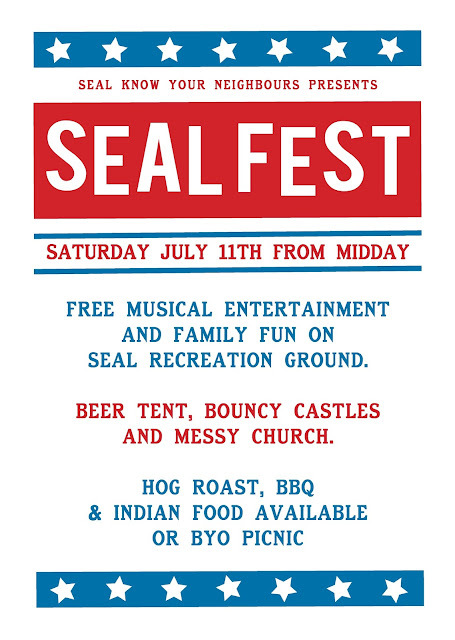 We went on to discuss the success of The 2014 Big Lunch and Seal Fest, and how we might follow this with a similar event this year. It was agreed we should try and link this in with the national event – The Big Gig. Jennifer and Ralf Kent will co-ordinate this event, which we decided should be held on Saturday July 11th. on the availability of the recreation ground and pavilion.. To ensure the safety of the musicians and the equipment this year, we will make efforts to ensure a better stage and waterproof cover. Ralf has already started to investigate the costs of this, and we would need to find around £1000. There will also be the usual set up costs, insurance, licenses, etc, so it was agreed to have a working party to organise this event. From the meeting, we have Jennifer, Ralf, Jenni, Marion, Debbie and Eva, If anybody else out there would like to take part in this, please contact me. There will be various tasks, from arranging the insurance, advertising, booking the food stands, etc. 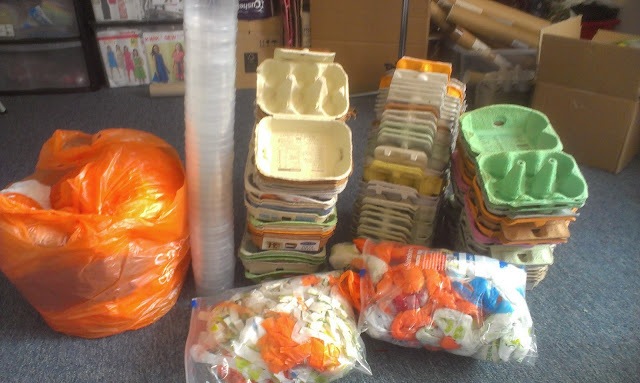 Anne will run the Messy Church at the event, which was very popular last year, and it was agreed to have free activities for the children wherever possible, but may book the inflatable assault course again. We will also hold a couple of small fund-raising events to help to finance the event. Eva suggested we approach West Kent Extra for application to the Linda Hogan Community Fund, and Roddy Hogarth said that Hayley Brooks at Sevenoaks District Council may also be able to help us to locate some community funds. Seal Parish Council may also be able to help with a small financial contribution. We can also approach Seal Village Association, but there is probably not a lot sitting in this fund at present. 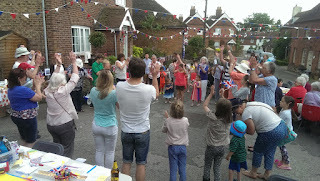 It was suggested that we hold a musical quiz night and maybe a St George’s Night event as fund-raisers. Watch out for further details. We discussed the questionnaire that was put around by Seal Parish Council, regarding the improvement of play equipment in Seal Recreation Ground. Not all of the results have been returned, so there will be more information once this has all been collated. Seal Parish Council will be held on May 21st at 7.30pm in the Pavilion, and it is hoped that many Seal residents will attend this year. After the formal meeting, a more relaxed discussion will be had, over a glass of wine. Eva reminded everybody that if anybody has furniture that they no longer need, Abacus House will collect this free of charge, for re-cycling back into the community. For more information, Eva’s e mail will also be at the bottom of the page. I would like to say a huge thank you to all those who attended today, and contributed to very lively discussions and put great ideas forward for building an even stronger community for the future.